We build systems to fit the way you and your employees work. And as your business develops and changes, your software from Meantime will develop and grow with you. ...and designed to do in a minute what it could take a week to do by hand. This leaves you free to focus on running your business, saving you time and money. By developing software around you and your business, we build exactly to your strengths and goals. A bespoke system does everything you need it to, meaning you aren’t paying for functionality you don’t use. Unite all your legacy systems under a Meantime solution and get everyone working from the same page. Your business is unique, so why isn't your software? These days, the online world is overflowing with apps and software but we're pretty sure there isn't one designed specifically for you and your business. So, if you're unique, then why isn’t your software? You can trust the team at Meantime to build an IT solution around you. We’ll make it personal by getting to know the problems you face. Big or small, whatever your requirements, we can help. Eggbase is a business with the unusual problem of needing to track poultry flock performance and analyse the data efficiently (with a big emphasis on efficiently). We built a solution which worked in the cloud - perfect for the poultry industry which is often based in the field! Meantime work in a collaborative way that is refreshing for all our team, there is always a commitment to understand what we are looking for and find a solution. Now we don’t have any pieces of paper coming into the oﬃce. After about 12 months of using AMaT, the process is entirely online. With the data we collect on the system we now have a level of intelligence we didn’t previously have. The task management system is easy to use for staff and customers. Thanks to Meantime, I've freed up three days a week that I can spend growing the business, and I've been able to take it to a level I never thought possible. I would not look elsewhere for either bespoke business software or support and can highly recommend Meantime. Throughout the design, build and testing phases Meantime have been exceptionally helpful. Meantime has offered us an exceptional and innovative service allowing our business to grow beyond all expectations. Dove Nest Group has worked with Meantime and particularly Fenner over the past two years and their solution providing ability has been excellent. We have always been impressed with both the response and the advice received when placing requests for additions to our original specification. Working with Meantime is so easy. They get the point straight away from the briefest of instructions and I hardly need to be involved. We’ve had a really positive reaction from staff, the system is very user friendly. As a major international airport, Dublin Airport has to manage over 27 million people per year flying to over 180 destinations. It’s operated by DAA, an expert in airport management and aviation services. Meantime's reputation within the aviation industry led Dublin Airport to appoint the company for the job of developing its Platinum Services booking system. The company delivered above and beyond expectations with a level of customer service which delighted Dublin. We badly needed a new system that would streamline our processes, allow us more time to grow the business and most of all enhance what we offer our clients. Meantime have not only delivered but have brought a level of customer service that truly makes us feel like a valued client. Headquartered in Switzerland, Sika is a speciality chemical company with expertise in the building and automotive industries. With annual sales of over £4 billion, Sika operates in 98 countries and employs more than 17,000 people. Sika sought Meantime for their expertise in transitioning systems onto a mobile platform. With much of the work done out on site, this prerequisite was the starting point for Meantime’s work. 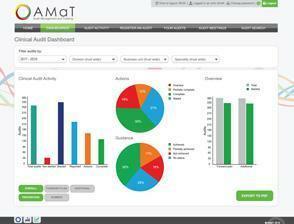 AMaT is an audit management and tracking tool for the health sector. The software was built to address key issues in the way audits are carried out at Health Trusts up and down the country. When Lancashire Care NHS Foundation Trust wanted to change how audits were done, Meantime realised the Trust’s aspirations went way beyond their budget. Always willing to back their own ability, Meantime decided to go ahead and build it anyway - at their own risk. 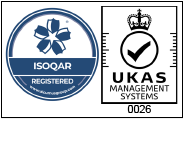 The result is a software service which leads the way in audit management and tracking and is in use or being considered across increasing numbers of other Trusts. AMaT is intuitive and perfectly aligned with our processes. Our clinical colleagues are queuing up to use it. With the AMaT system clinical teams can see everything, governance teams can see everything. It is much more open. AMaT has reduced the time taken to carry out an audit, and increased visibility of the process. Heathrow Airport is a major international airport in London, United Kingdom. Heathrow is the third busiest airport in the world by international passenger traffic, as well as the busiest airport in Europe by passenger traffic, and the sixth busiest airport in the world by total passenger traffic. In 2010 Meantime were invited by BAA's Business Support Centre to write a system to manage appointments at the ID Centres at their six airports. There was a strict (and close!) deadline but we delivered to their requirements, on time and on budget. Such was the success of that project that we were then invited to write a system to manage the registration and, later, deployment of people who wanted to volunteer to help at Heathrow for the 2012 Olympics. Since then, we have written a system to deploy non-operational staff around Heathrow on those occasions when extra help is required in the terminals, a booking system for VIPs passing through the airport's private suite, and systems to manage the training of external staff who are working at the airport (the staff at Costa, for example), which was recently extended to cater for construction contractors at the airport. The system was built and delivered within two months, branded the way we wanted, built the way we wanted, and with a lot more intelligence than we’d anticipated. The software will pay for itself in a short period of time. A system this intuitive really is worthwhile. A robust, reliable system for a competitive price, with the ability to deliver within a very short space of time. Lynn McNicholl, project leader, Heathrow Airport Ltd. Councils and paperwork go together like sunshine and showers in that one of those things is best put aside. So when Colchester Borough Council management realised the danger of drowning in a deluge of forms, they called Meantime. We looked at the existing process, which involved keeping all team work tasks being kept on spreadsheets and printed out each day, and threw the whole thing in the recycle bin. An entirely new app for Android now provides a scheduled booking system, as well as alerting street teams to incidents requiring immediate attention and directing them to the precise areas using interactive maps. Meantime's app was even built to compliment the council's existing booking and reporting system, so there was no need for an expensive overhaul of all the IT equipment. Planning is now efficient and issues such as cancelled appointments are easily dealt with meaning the initial trial was rolled out to an additional nine local authorities. Catch Up® is a not-for-profit charity working to address literacy and numeracy difficulties that contribute to underachievement. One of the vital links in the learning chain of children struggling with literacy or numeracy is a charity called Catch Up. Their work in offering complete training, resource and support packages can make all the difference. Unfortunately, when it came to IT systems, Catch Up needed to catch up. Their existing solution could not keep pace with the growing number schools, teachers, resources, and service offerings they were dealing with. After they approached Meantime, we developed a new website, content management system, expanded administrative capabilities, and a robust new online booking system which enabled schools and teachers to sign up. The full online automation of what previously involved copious amounts of paperwork, meant Catch Up could become a effective at delivering their core services and face the future ahead of the curve. 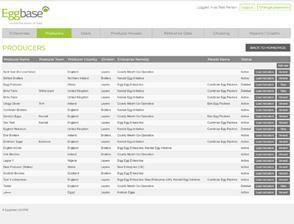 Eggbase was founded in 2011 by Managing Director Anne Fleck. Many businesses in the egg and poultry sector now rely on Eggbase software. Proving there's no field in which a strong IT solution can't make a difference, our work for Eggbase makes it possible to manage all aspects of egg production. The result enabled the company to reach a staggering 400% growth in just 12 months but the process was as delicate as handling the eggs. In order to fulfill the brief, Meantime had to unite a group of standalone and static applications and make them accessible anywhere at anytime. The already popular software was making too many demands on owner Anne Fleck's time and desperately needed a complete overhaul. We carried out a consolidated approach, putting everything online to make Eggbase accessible anywhere in the world from any computer, smartphone or tablet. This, and a whole new level of functionality, means Anne can really count her chickens. The team at Meantime really listen to what I need and are excellent at interpreting it. The attention to detail from Meantime is very satisfying, they're logical, they're thorough and I can't speak highly enough of them. Entrust Social Care was established over fourteen years ago since which time they have built and developed relationships with hundreds of clients throughout the Public and Private Sectors, across the UK, supplying the highest calibre qualified Social Workers and Support Workers within Children's Services, Adult Services, Mental Health Services and Youth Offending. The success of Entrust Social Care meant that commercial director, Ian Brindley, was spending two days each week manually inputting timesheets and contract details into spreadsheets. The rules and regulations associated with the business complicated the process even further. Meantime were called upon in order to streamline this into a bespoke solution which would enable further growth and cost-savings. We created a database which could store every detail about Entrust's clients and their locums including pay rates, tax rates and contract details. On top of this was placed a user-friendly admin interface which enabled the system to be easily kept up to date. Reports were easily obtained and the automation led to all the hoped-for savings. And all because of Entrust's trust. Meantime's bespoke business system has saved us a significant amount of operational overheads and at least one member of administration staff, to the tune of at least £20,000 each year. Without the bespoke software from Meantime, we simply wouldn't have been able to expand the way we have. We haven't had a single second of downtime since Meantime's bespoke software was implemented. We have been working with Meantime for the past four years and have received an absolutely excellent service from day one. The quality of Meantime's business software is unquestionable and we have had no system outages over the four year period. Edge of the World is where adventurous people go to look for clothing to kick back and relax in. Their commitment to quality, service and a totally laid-back vibe has helped them grow across the North of England. Our belief that great communication leads to a great partnership has served us well with Edge of the World. Their desire to maintaining a clear dialogue with their customers led them to commission the development of a bespoke email system from Meantime. They wanted a system which could take email addresses from wherever the customer chose to give one: from in-store when asked at the point of a sale, from the website, or from anywhere else staff might choose to request one. These email addresses then had to be categorised in order for Edge of the World to better understand how to interest and incentivise the customer. Such a mailing solution could not be bought 'off the shelf'. It meant Meantime and Edge of the World working together to identify the needs of the business and its customers. But given that our partnership with them has lasted many years, we believe they made the right choice. Coniston Corporate Embroidery is based in the Lake District at the head of Coniston Lake. Established in 2000, Coniston Corporate supply workwear and bespoke embroidery to their UK wide customer base. An overly complex ordering system meant Meantime needed to unpick lots of problems for this embroidery company. Coniston provided a white label service to its clients so they could sell clothing to their own customers. But the process needed to be centralised and streamlined and to link each customer's website to their own processing system. Over the past 35 years, Dove Nest Group has developed and delivered world-class training and development solutions that enable organisations to unlock their potential through the development of their people. When it comes to coaching businesses to succeed, Dove Nest is a clear leader. But as so often happens with companies, they were too busy to give themselves a pep talk. They needed to move from a paper-based system to one which could meet the demands of a growing business. Meantime did a comprehensive audit of how Dove Nest worked and proposed a system which would be fully online and cover everything from client assessments to reporting and invoicing. The result was a robust and scaleable solution which acted as a kind of 'scoring brain' which could handle individual assessments, include interviewers' comments and then produce an instantaneous report. We did such a good job, it enabled Dove Nest to sell into third parties and open up an entirely new revenue stream. That, and a £100k return on its investment, gave them a very tidy nest egg indeed. Together with Meantime we have been tackling unsolved challenges for our very demanding clients and developing intellectual property that is groundbreaking. Fenner took the time to travel across the country to talk to our client to get a real feel for their requirements. We’ve seen a return of between £90,000 and £100,000 each year since Meantime developed our bespoke business software. Meantime’s bespoke business software has made us much more efficient as a company. Developing bespoke software with Meantime has made us market leaders. The Helen O'Grady Drama Academy is the only organisation of its kind in the UK and had its origins in Australia many years ago. In 1979, Helen O'Grady, a trained teacher, drama teacher and actress, hired a hall in a Perth suburb and commenced after school drama classes for children. Her aims were to provide a self-development through drama programme for children. With over 15,000 students, the biggest drama Helen O'Grady Academies had was in keeping track of everyone. This was made even more difficult when all those students are spread across 50 sites in the UK, each with different Principals all doing admin their own way. It left the UK's leading acting academy in need of strong direction. That's when Meantime was appointed and together we gave it the MIDAS touch - a web-based system which stands for Management Information Data and Support. Our bespoke solution replaced the old paper system and made it possible to keep track of pupils, maintain accounts, and deliver marketing campaigns. It was the 24-7 approach Helen O'Grady Drama Academies needed enabling tasks that would usually take a day to be completed in just ten minutes. Needless to say, it became a smash hit. The cost of installing the system has been treated as an investment for the future of the business and enabled it to grow. The system has released our franchisees to spend more time on marketing and promotional activities, which in turn has led to the expansion of their own individual businesses. When our company was considering a web-based management system for our franchise network, Fenner and his staff provided us with a business system which met all our needs. The main factors for the excellent relationship we now enjoy with Meantime is their flexible approach and promptness in dealing with any enquiries by us. We look forward to continuing working with Fenner and his staff for many years to come. Retro Co is an online shop for A Card And A Gift, the company that sells the iconic CD and DVD cards throughout the world. As less and less people have CD players and move to enjoying to their music on MP3 players, Retro Co needed a mechanism to download musical content to people who had purchased one of their cards. RetroCo's business model - of allowing customers to create birthday cards on disc featuring songs from the birth year - was in danger of becoming a little too retro for its own good. It needed to move with the times and allow for downloading tracks, as well as receiving physical CDs. So they called Meantime and our solution was music to their ears. We built a system using Amazon Cloud to manage the uploading and downloading of the files. This was capable of handing the demand, no matter how busy things became. Amazon's server also had the benefit of being the most cost-effective way to do this - able to adapt to demand but not costing the earth during idle times. And by use of a neat approach to file management, we also helped RetroCo upload individual tracks but have them delivered as a single package - meaning customers on slower systems could move at their own pace. It was all another bespoke solution and a number one hit for RetroCo! Working with Meantime has been a revelation. There’s absolutely no question we’ll continue working with them in our future IT projects. Fenner is methodical, very bright and has an ability to see exactly what I need. With Meantime, everything gets done quickly and with minimum effort. I’ve never had such a good experience with an IT company before. eatsleepthink are an award-winning team of creative individuals with a passion for great work. With a diverse range of talents and US partner G&S Business Communications, Eatsleepthink offer a genuine promise of originality, creativity and innovation all over the globe from the outskirts of Sheffield. When faced with a client called eatsleepthink Design, we knew we'd have to prove that Meantime ate, slept and thought about our business too. Luckily, the attention to detail we show every project shone through as we tackled a complex project to develop an app for young people facing life challenges. Working closely with eatsleepthink and Sheffield Futures, we brought all the content and resources together in a multi-device app called Mi LifeMapp. Our technical skills, however, was only part of what made this collaboration a success. With this project being so sensitive, eatsleepthink wanted a partner who could work to a vision, respecting the many issues surrounding it. As proud as we are of our technical abilities, in this case we are even more proud that we're that partner. Always keen to make the best use of technology in order to get value for money, South Lakeland District Council had a problem with its existing procurement system and called upon Meantime to find a bespoke solution! Costing just £4,000 to develop and install, our new system was designed to save time and money by making the process a whole lot simpler. Real time tracking assisted in freeing up paperwork and support calls whilst automatic cost calculations and the ability for the software to be used securely across multiple sites brings even great efficiencies.